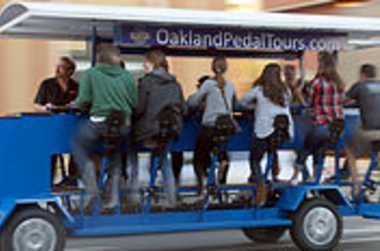 Experience the city of Oakland in a whole new way! Stops along the way at some of the best breweries in town! Our pedal tours are conducted on a 14 passenger bicycle. You can book the entire bike and bring yourself plus up to 13 friends, or you can book individual seats. Just climb on for a party while you tour the best craft beer taprooms and breweries in the Bay Area! The best part is, we drive, so all you have to do is pedal as we move along at approximately 5 mph.